Jerome Hayden Powell (born February 4, 1953) is an American lawyer. He is the 16th and current Chair of the Federal Reserve since February 2018and a member of the Federal Reserve Board of Governors and has served since 2012 upon being nominated by President Barack Obama. 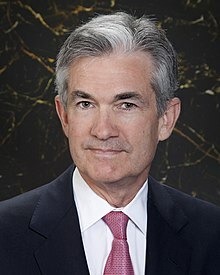 On November 2, 2017, President Donald Trump nominated Powell to serve as the next Chair of the Federal Reserve. His nomination was confirmed by the United States Senate on January 31, 2018 and took office on February 5, 2018. Powell was born in Washington, D.C.. He studied at Princeton University and at Georgetown University. In 1975-1976, he spent a year as a legislative assistant to Senator Richard Schweiker of Pennsylvania. From 1984 to 1990, Powell worked at Dillon, Read & Co.. Between 1990 and 1993, Powell worked in the United States Department of the Treasury, at which time Nicholas F. Brady, the former chairman of Dillon, Read & Co., was the United States Secretary of the Treasury. In 1992, Powell became the Under Secretary of the Treasury for Domestic Finance after being nominated by George H. W. Bush. In 1993, Powell began working as a managing director for Bankers Trust, but he quit in 1995. Powell founded Severn Capital Partners, a private investment firm focused on specialty finance and opportunistic investments in the industrial sector. On November 2, 2017, President Donald Trump nominated Powell to serve as the Chair of the Federal Reserve. On January 31, 2018, Powell was confirmed by the United States Senate. In 1985, Powell married Ellissa Leonard. They have three children. Powell's net worth is estimated to be as much as $112 million. ↑ 1.0 1.1 Gensler, Lauren (November 2, 2017). "Trump Taps Jerome Powell As Next Fed Chair In Call For Continuity". Forbes. ↑ GREENHOUSE, STEVEN (April 14, 1992). "New Duties Familiar To Treasury Nominee". The New York Times. ↑ "Banker Joins Dillon, Read". The New York Times. February 17, 1995. ↑ "Nomination of Jerome H. Powell To Be an Under Secretary of the Treasury". University of California, Santa Barbara. April 9, 1992. ↑ Business Wire (July 8, 2008). "GEF Adds to Investment Team". Press release. http://www.businesswire.com/news/home/20080708006018/en/GEF-Adds-Investment-Team. ↑ "PN1350 — Jerome H. Powell — Federal Reserve System". United States Senate. ↑ Lane, Sylvan (23 January 2018). "Senate confirms Jerome Powell as Fed chairman". TheHill. ↑ The Hill. "Senate confirms Jerome Powell as Fed chairman". Retrieved January 31, 2018. ↑ "ELISSA LEONARD WED TO JEROME H. POWELL". The New York Times. September 15, 1985. ↑ Long, Heather (October 31, 2017). "Jerome Powell, Trump's pick to lead Fed, would be the richest chair since the 1940s". The Washington Post.